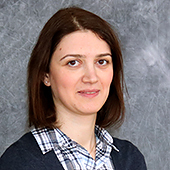 Sofia Poulikidou is a researcher in the area of environmental systems analysis. The focus of her work is on the transport sector, including transport fuels. In her research Sofia evaluates the performance of future transport fuels from an environmental and life cycle perspective (i.e. from resource extraction, to fuel production and use in the vehicle). Sofia has previously worked with sustainable product development, material selection for lightweight vehicles, environmental assessment of electric vehicles and more. There might be more projects where Sofia Poulikidou participates, but you have to be logged in as a Chalmers employee to see them.